The knee is the articulation, or meeting, of the femur and tibia bones. The kneecap, or patella, is a bone that forms in the tendon of the quadriceps muscle. The femur, tibia, and patella bones make up the knee. Arthritis that develops in the knee can affect the joint between the tibia and the femur or the patella and the femur. The tibia and the femur have a medial and lateral (inside and outside part of the knee) joint. Therefore, there are three compartments to the knee: 1. the medial compartment, 2. the lateral compartment and 3. the patello-femoral joint. Arthritis often affects all the compartments of the knee. Sometimes, arthritis develops in only one of the compartments. A total joint arthroplasty (replacement) is considered when there is diffuse destruction of the knee. A unicondylar arthroplasty replaces only one of the compartments (which are also known as condyles, hence the term “condylar”). It is not always known why only one of the compartments is affected. Sometimes it is due to overall alignment of the knee, but this is not always easily defined. The unicondylar arthroplasty has the theoretic advantage of shorter operative time, less removal of native bone, and quicker rehabilitation. It may also delay the need for a total knee arthroplasty or negate it. Not all surgeons agree with the utility of the unicondylar replacement. Some studies may suggest the theoretic advantages are not always realized. 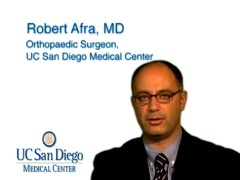 The surgery for the unicondylar replacement is similar to a total knee replacement. A large incision is made on the front of the knee. The joint surface and a small amount of bone of the affected compartment is removed and replaced. Metal is used on both sides of the joint with a plastic insert that acts as the new joint space. Postoperatively, rehabilitation begins almost immediately. Weight bearing as tolerated is often allowed and the knee is usually placed in a continuous passive motion machine, which moves the knee automatically while at rest in bed. The goals of rehabilitation are the same as after any surgery. To gain full usage, and pain-free range of motion, of the knee.